Spring is here and fruits and vegetables are coming up in the garden! At Roots to Plate we believe fresh is always best. 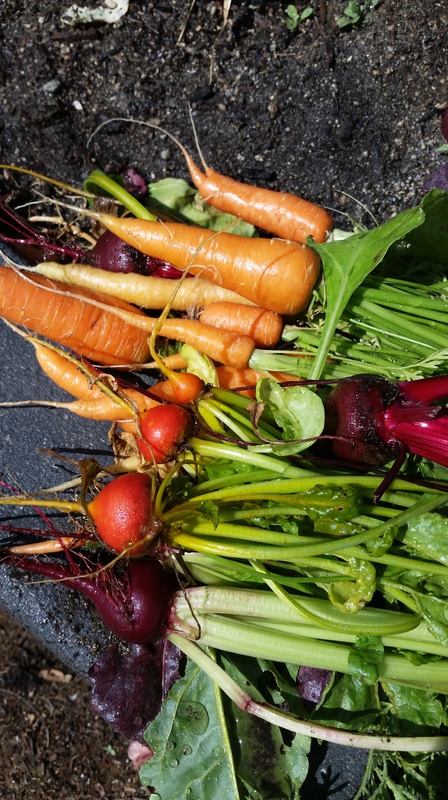 Rainbow beets and carrots will be highlights in our clients menus. And should be in yours too! 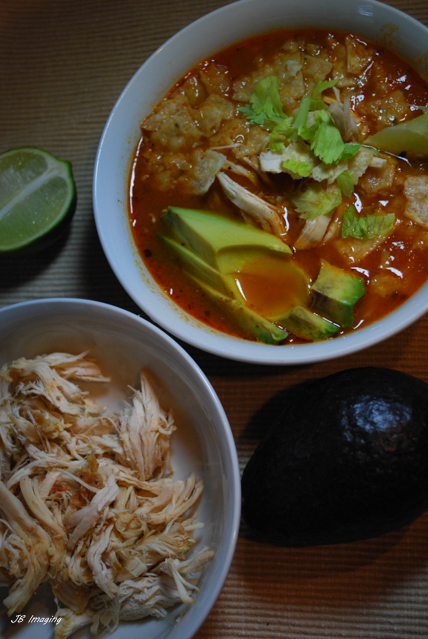 Warm and familiar; Chicken Tortilla Soup is a favorite. The beauty of this recipe is its simplicity. As always, fresh ingredients are the key to this rich soup. Do you have time to put ingredients in a crock pot and then walk away? 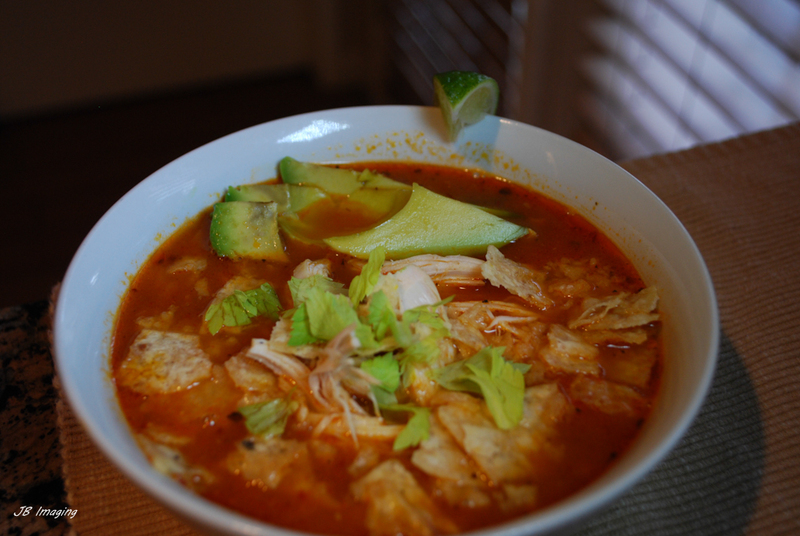 Then you have time for this classic, earthy Chicken Tortilla Soup! Ok so we lied: there is a little bit of chopping here. Start by chopping the onion. Place the onion in a large pot with a bit of butter or olive oil. Saute until slightly browned. Meanwhile, place the peppers with 2 cups of the chicken stock in a blender. Pulse until smooth. Add the sauteed onion, pepper mixture and chicken into a crock pot. Cook on low for 6 to 8 hours. Next back to the pot that you sauteed the onion in. Laddle the chicken from the crock pot and put into the large pot. At this point, the chicken should be falling apart. Add the Hominy, Cumin, Paprika, half of the chopped Cilantro or Celery leaves and chicken stock. Cover and simmer on low for 20 minutes. Remove from heat and season with salt and pepper to taste. Serve this soup with chopped avocado, cilantro, sour cream and tortilla chips. Then sit back and enjoy! 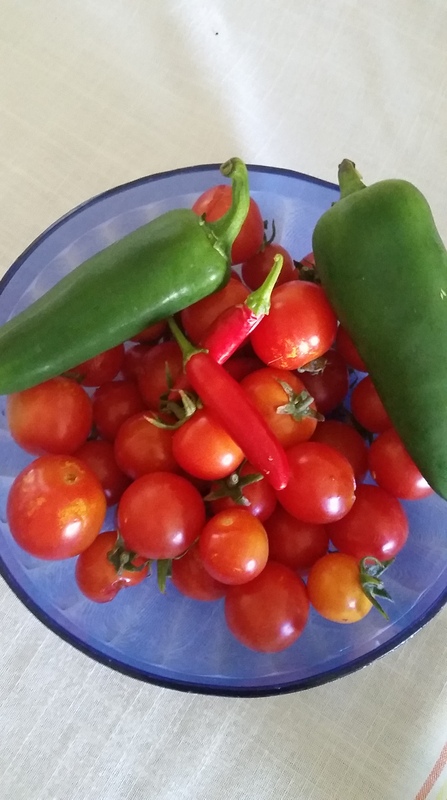 Summer is a great time to harvest tomatoes and peppers. 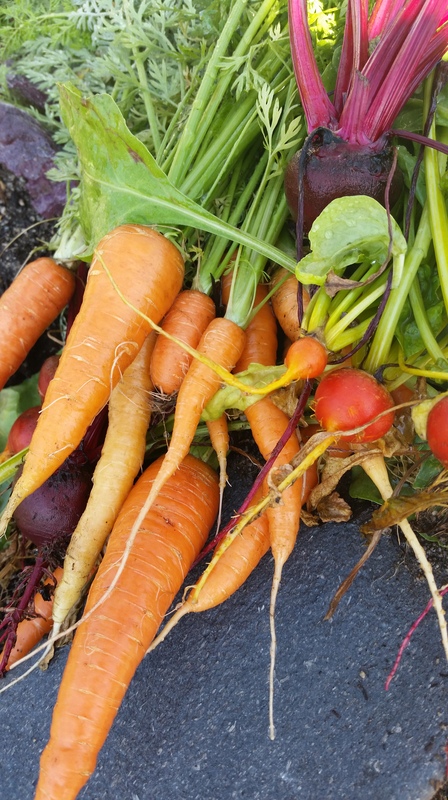 These gorgeous vegetables are ripened to perfection with summer when properly tended to in scorching heat. These vegetables thrive with the ambient heat of summer. However, they can burn when not properly shaded. Other risk factors include: premature ripening of fruit, burned leaves and small numbers of producing. Many home improvement stores offer products to shade your plants. For those interested in more of a DIY shade structure; the process is simple. Suggestions include non-porous stakes, such as white PVC piping. PVC bent to your desired shape (usually arched) will work well as the “base” to drape your shade fabric. Speaking of fabric; always use landscaping shade cloth that is designed specifically for that purpose. Unfortunately, using any other type of fabric as a shade barrier can result in some very negative effects for plants. What else can you do to protect your plants? Start at the roots! You should have already been using compost as a natural fertilizer, now is a good time to mix in some with the existing soil at the root base. Summer is also a good time to add mulch around the root base of your summer garden. Water, Water, Water… At the right time! Avoid watering overhead during this time of the year. Droplets of water left in direct sunlight can result in sunspots on your plants. Watering during the day can also prove to be futile as the desert air dries out the soil. Watering early morning, early evening and at night will ensure that the plant receives all the water that it needs. Pruning and Harvesting! Tomatoes are ready, peppers too and those artichokes need some pruning. When is the best time to prune and harvest? Its arguable with some gardeners; however, in the desert: morning is best right after your first watering. 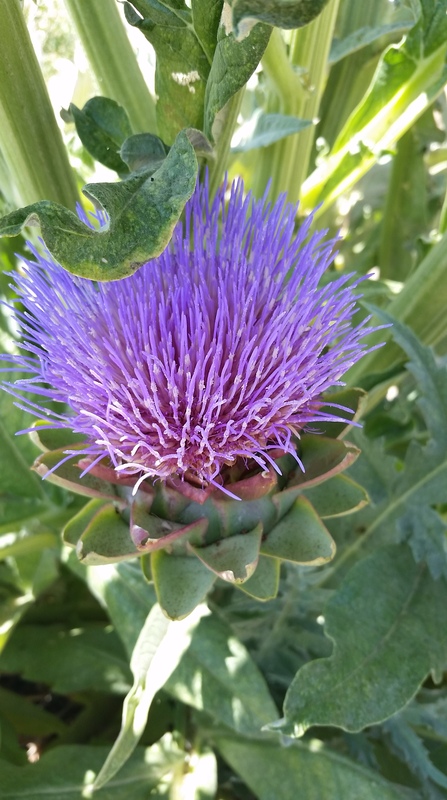 Here an artichoke has been left to bloom in the summer. These blooms are strikingly beautiful. However, one the plant has reached the bloom period it is not advised to harvest from the plant. Allow the plant to complete its blooming cycle. 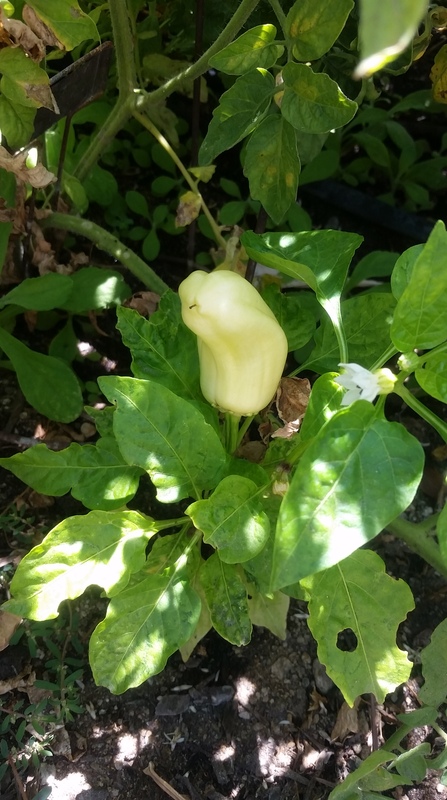 Plants such as tomatoes and peppers which also bloom, can and should be harvested when they have blooms. The rule of thumb for pruning and harvesting applies to herbs as well. Remember: at first light, is just right!